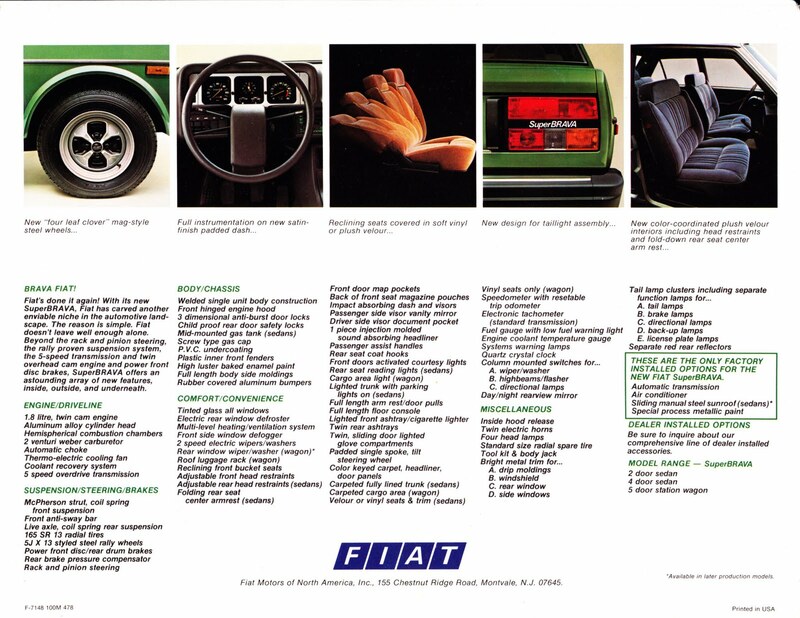 There is a story on the Internet of a 1980 Fiat Brava with 500,000 miles and still going strong. You can read about it here. Owner Gil Cormaci has racked up that impressive number by making a 150 mile daily commute for, no doubt, quite a few years. The car still has original paint and engine. 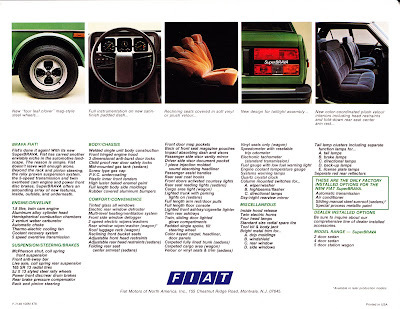 In celebration of Gil Cormaci's accomplishment, let's take a look at the Fiat Brava of old. The Brava was an upgraded version of the Fiat 131 Mirafiori, and was sold in the US from 1978 to 1982 . The 131 Mirafiori was named to honor Fiat's Mirafiori factory on the outskirts of Torino, Italy. Mirafiori translates to wonderful flower in Italian. 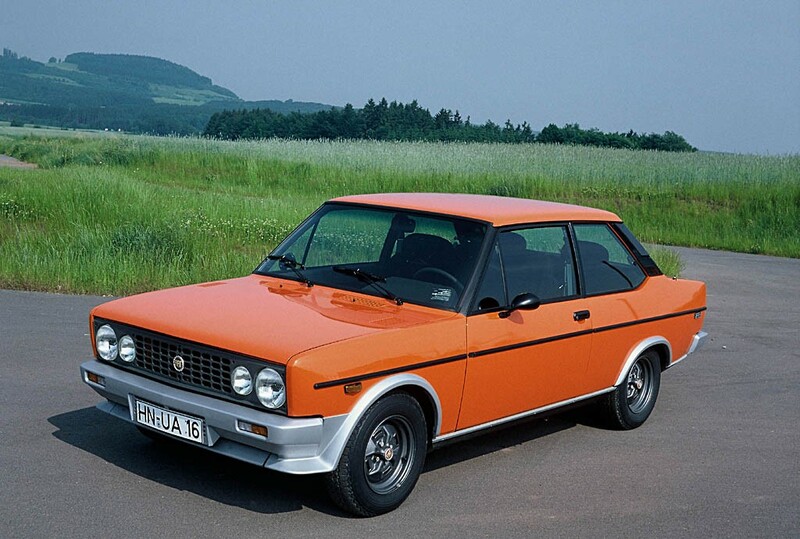 The 131 was introduced in Europe in 1974 and replaced the 1966 European Car of the year Fiat 124. In 1975 the 131 made its way to the US. Like the Fiat 124, the 131 was a conventional rear wheel drive sedan. It offered a conventional layout but upgraded with the latest engineering, design and safety features of the time. Popular Fiat commercial from the 1970's. Its twin overhead cam engine, 5 speed gear box and a brake proportioning valve controlled by the ride height were extremely rare features on cars back then, regardless of cost. Fiat 128 Rally undergoing a rollover test. Look familiar? Later, the tests were modified by having the cars towed and then released to crash into each other. These types of crash tests were better able to reproduce real life conditions, especially for the time era. 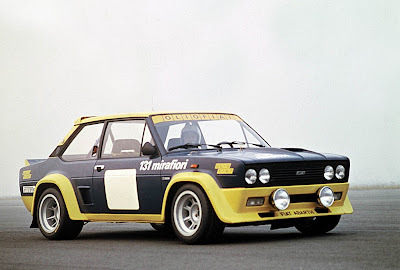 Another thing to look for is the Fiat 128 Rally at the end of the film being catapulted into a rollover. Compare that to the popular Mercedes Benz commercial being played today. Seems the results are similar! The Fiat 131 benefited by this research and besides having a body that featured energy absorbing front and rear sections, offered rear seat shoulder harnesses and most notably, a gas tank tucked behind the rear seat and out of an impact zone. Again, features very uncommon, especially in America. 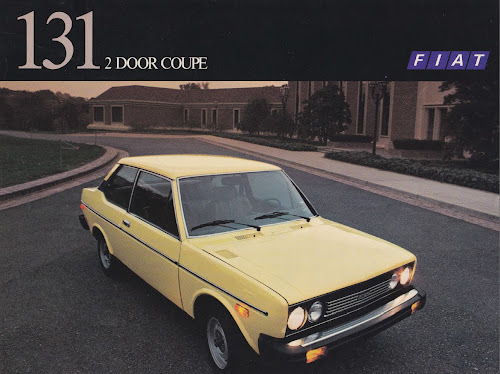 In Europe, during the 1978 model year, the 131 underwent a face lift and name change. This new, upgraded car was called the SuperMirafiori and, in the US, became first known as the SuperBrava and then just Brava. This new version offered an upgraded interior and slightly revised exterior looks. Exterior changes included a new hood, trunk lid, redesigned grille, taillights, gas cap, C-pillar air extractors and new wheels. Eventually a small chin spoiler was also added. 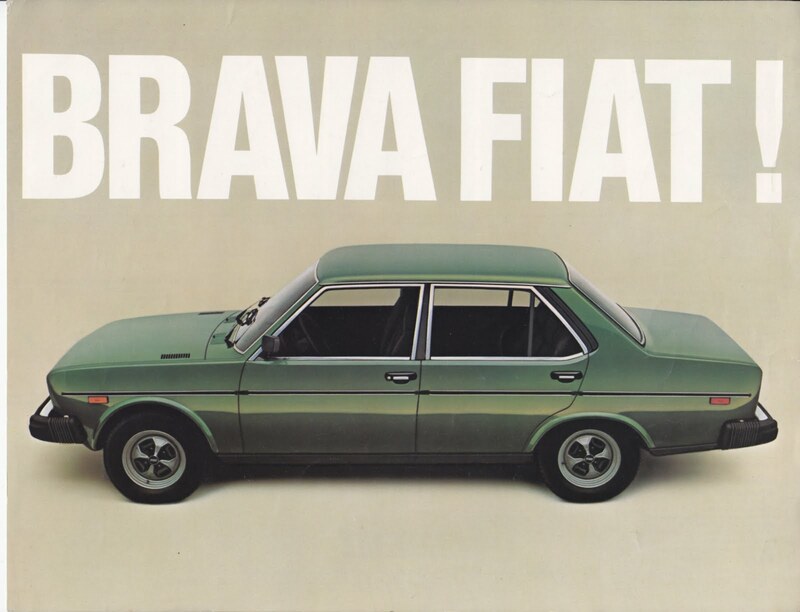 The Brava was sold in America until Fiat withdrew from the market in 1982. In Europe, the car continued to be sold until 1984. Interestingly, Fiat sold the 131 to other companies as Complete Knock Down Kits (CKD) and is still in production in Ethiopia by the Holland Car Co. While we in the US only received the 131/Brava, there were a couple of Euro versions that are worth looking at. First is the 131 Abarth Rally. This version was developed specifically for rallying with 400 homologated for sale. A clever new multi-linked rear suspension was fitted along with, for the first time on a production car, 50 series Pirelli P7 ultra high performance tires. 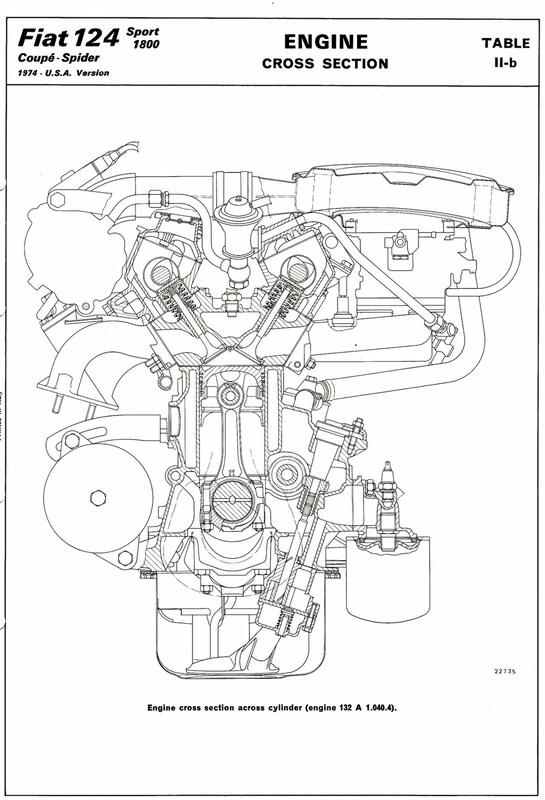 US version of the Fiat 132 engine, first used in the 124 Sports then in the US 131. The first affordable, mass produced twin overhead cam engine, by 1979 over 1 million of these engines were produced. * Fiat's gift to car enthusiasts everywhere. Aurelio Lampredi, former Ferrari engine designer, in charge of Fiat engines and head of Abarth in the 1970's, designed a new 4 valve cylinder head for his twin cam engine, now at a capacity of 1995 cc. Inlet valves were 34mm and exhaust were 28mm at in included angle of 46 degrees (2 valve twin cams have a 66 degree included angle). The street version equipped with a Weber 34 ADF carburetor produced 140hp @ 6400 rpm/130lbs.ft @ 3800 rpm. For competition use, Kugelfischer mechanical fuel injection was fitted and power went to 215hp @ 7000 rpm/166lbs.ft @ 5600rpm. There was also a supercharged version with 285hp. Side note: Over the years, this 16 valve engine, installed in various forms and cars, went on to win 10 World Rally Championships. 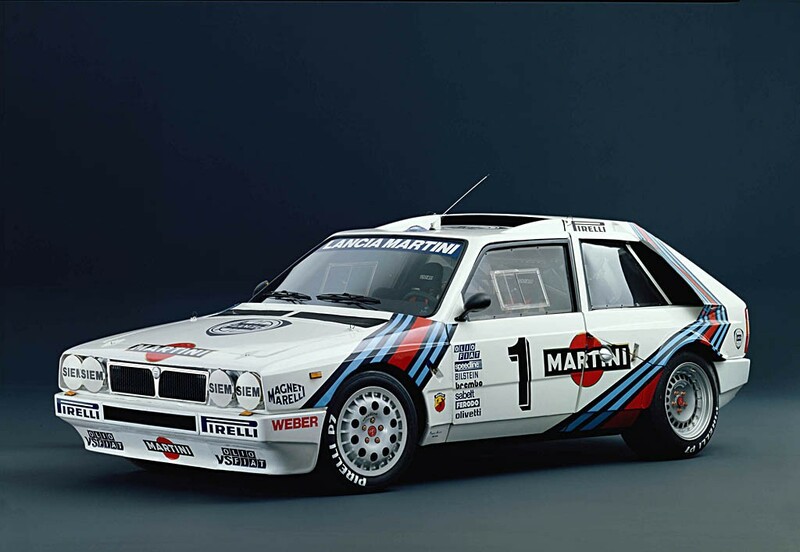 Ultimately, in 1985 a turbocharged/supercharged version was installed in the legendary Lancia S4. 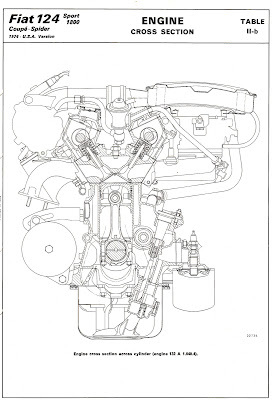 This 1.8 liter engine has been reported to produce upward of 550-700hp. Performance with the base engine produced 400 meter standing starts at 15.3 seconds and 28.6 seconds for the kilometer. The competition versions would average 14.7sec for the 1/4 mile, 0-60mph in 6.6 seconds and 0-100mph in 17.5 seconds. 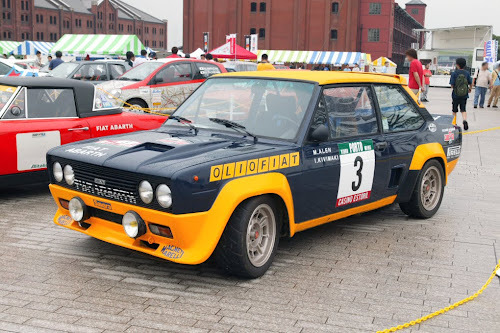 The 131 Abarth was capable of brutal performance and went on to win numerous races, winning the World Rally Championships in 1977, 1978 and 1980. Looking back the 131/Brava is not a bad way to commute even today. Hats off to Gil Cormaci for reminding us how cool the 131/Brava was. I'll take mine with a set of fender flares and 10inch wide rear wheels! Chris, please get the word out, Fiat USA is taking a vote on how to change the badging on the 500 for the USA! This could be a disaster!! I do not Facebook, so I can not vote. but if I could - I would say DO NOT CHANGE IT! this is their ad agency at work, I am sure. Do you have the names and address of the people at Fiat N America, so we can start a email and snail mail campaign?! I saw this campaign on FB too and I'm not sure I like the idea of calling it anything else BUT the Fiat 500, although the Italian word for 500 is legit, but still, the badging itself does not need to have it, just the simple 500 will do, thankyouverymuch. You can voice your opinions on facebook or autoblog. I've checked it out and some people also want to leave it alone. Yup! Fiat 500 should stay fiat 500. As can be seen throughout history, fiat 500 is one of the best cars of all time from my point of view. It's one great city car!